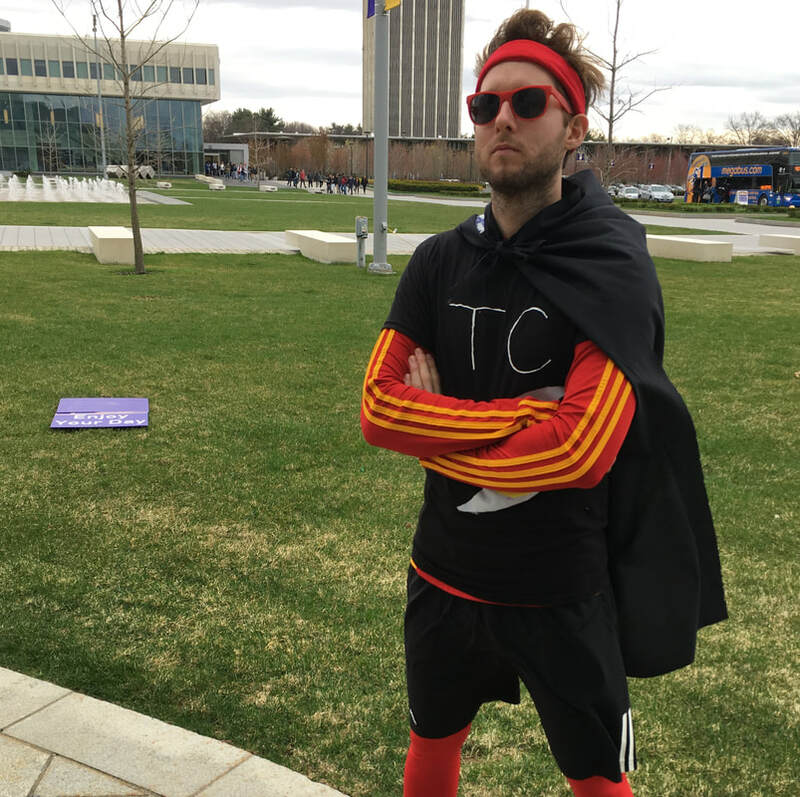 ﻿﻿I am a graduate student at the University at Albany, State University of New York. 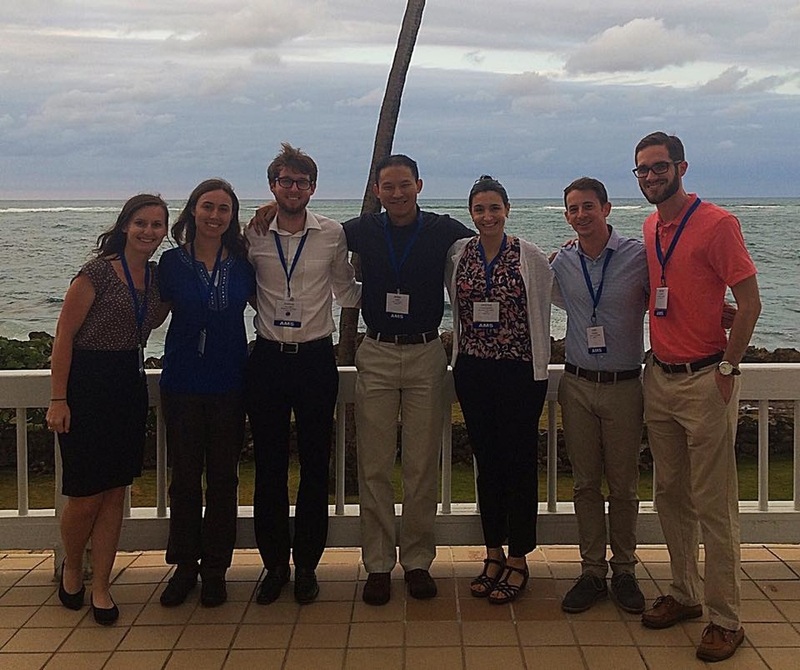 I study tropical cyclone development and intensification under the supervision of Drs. Kristen Corbosiero and Brian Tang. I graduated from Iowa State University in Spring 2013 with a Bachelor of Science degree in Meteorology. 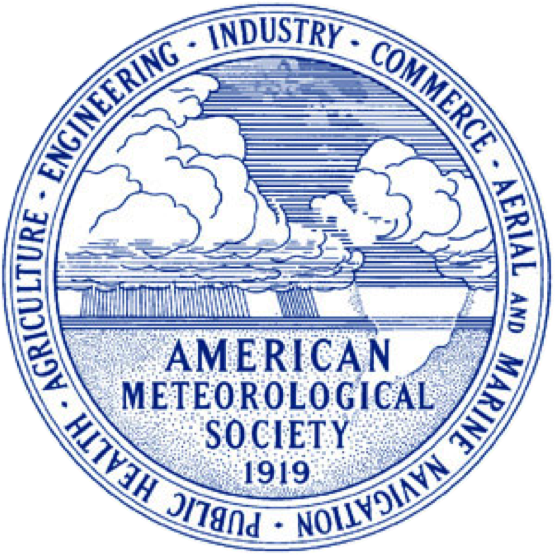 I am very excited to work and collaborate with SUNY-folk and the rest of the meteorological community to further our understanding of this complicated but extraordinary science. Feel free to contact me! 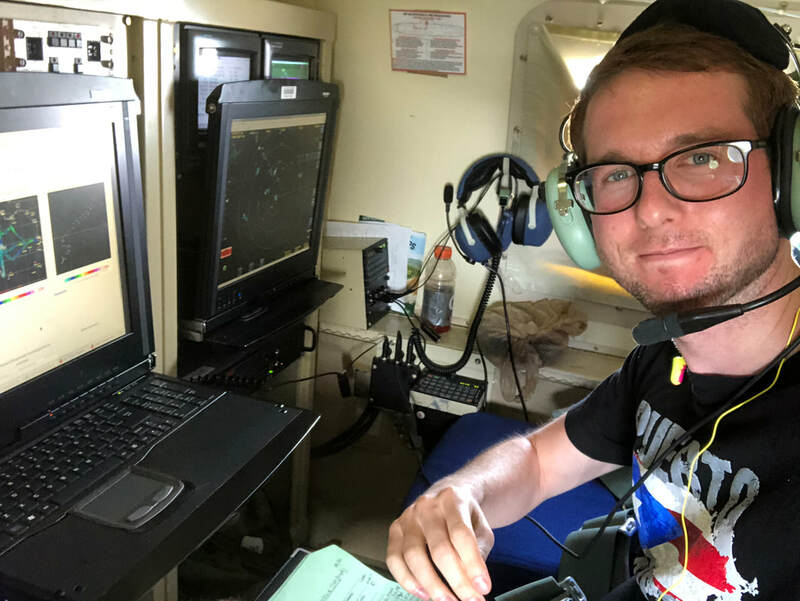 Participated as a Flight Scientist on a P-3 mission into Tropical Storm Gordon with Hurricane Hunters and HRD scientists. 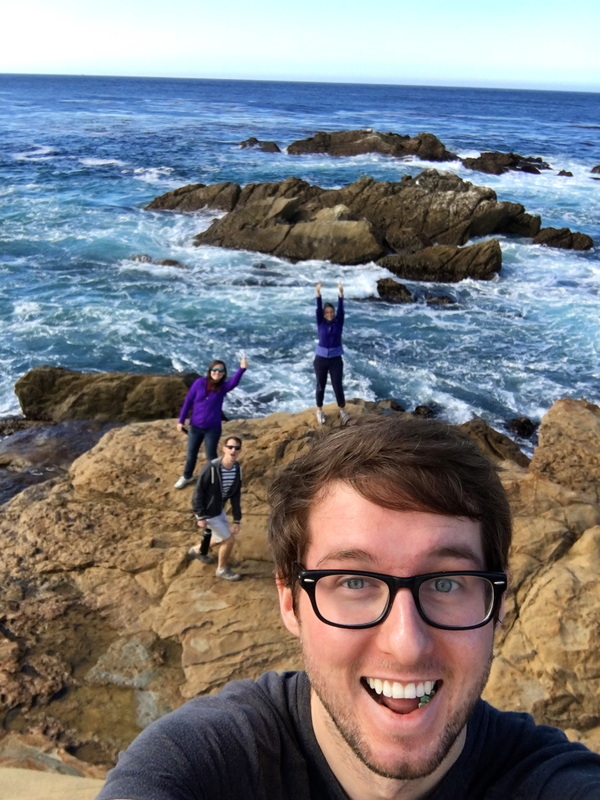 More pictures are on the HRD blog HERE. 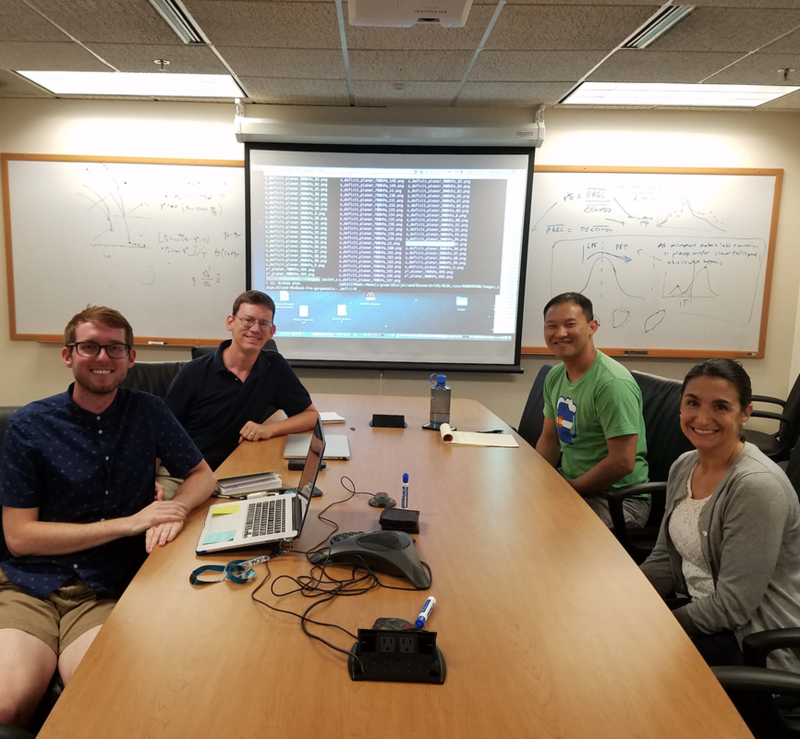 Spent the summer at NCAR collaborating with Dr. George Bryan on my dissertation research through the ASP Graduate Visitors Program. 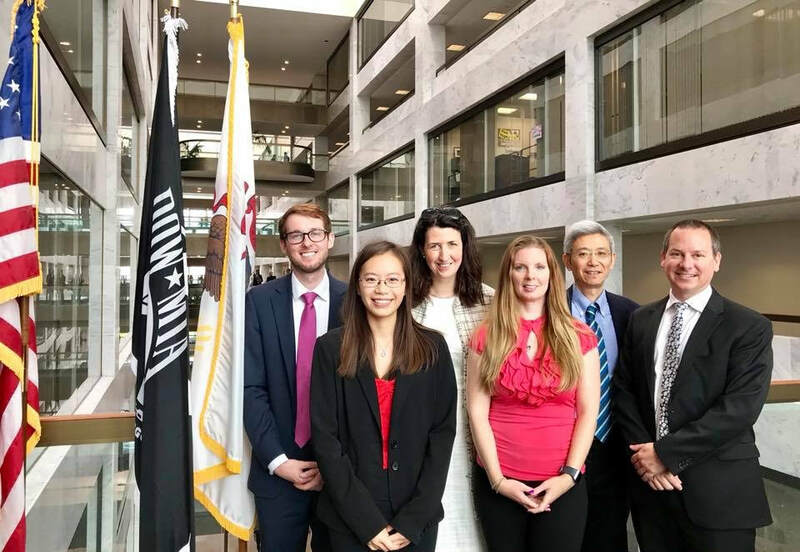 Advocated for basic science research funding with UCAR PACUR members at Capitol Hill. University news article about this experience can be found HERE. 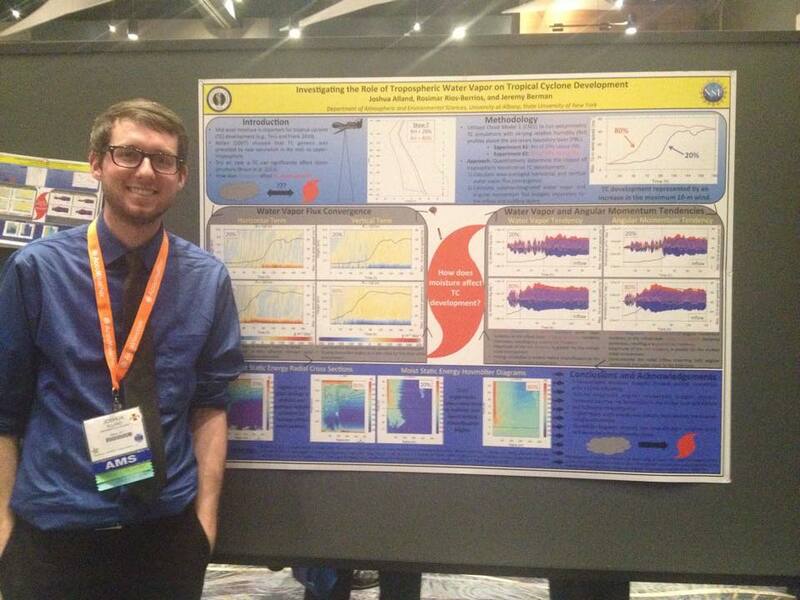 Presented at the 33rd Conference on Hurricanes and Tropical Meteorology. Summary: Mid- and low-level ventilation have specific 3D structures, both of which have implications for inhibiting convection. Published a first-authored peer-reviewed journal article. ​Summary: Midlevel dry air is transported into the subcloud layer by the downward branch of the secondary circulation, acting to decrease both the radial width of convection and the net upward vertical mass flux in simulated tropical cyclones. 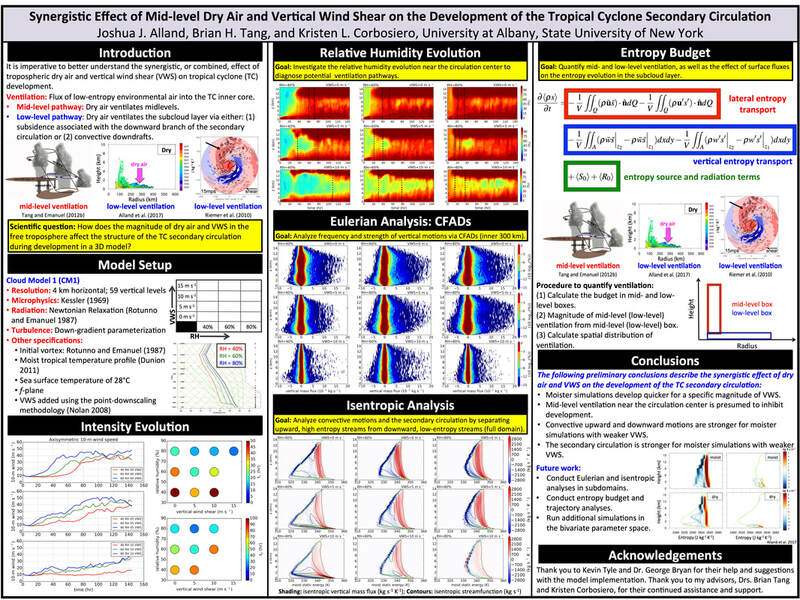 Presented at the 8th Tropical Meteorology Workshop. ​Summary: Midlevel ventilation near the circulation center is presumed to inhibit development. The secondary circulation is stronger for moister simulations with weaker vertical wind shear. Outreach: Participated in our annual Family Earth Day event to spread science knowledge to the community! I dressed up as a "Weather Friend." These types of outreach activities are my favorite part of being a scientist! Presented at UAlbany's College Teaching Symposium. 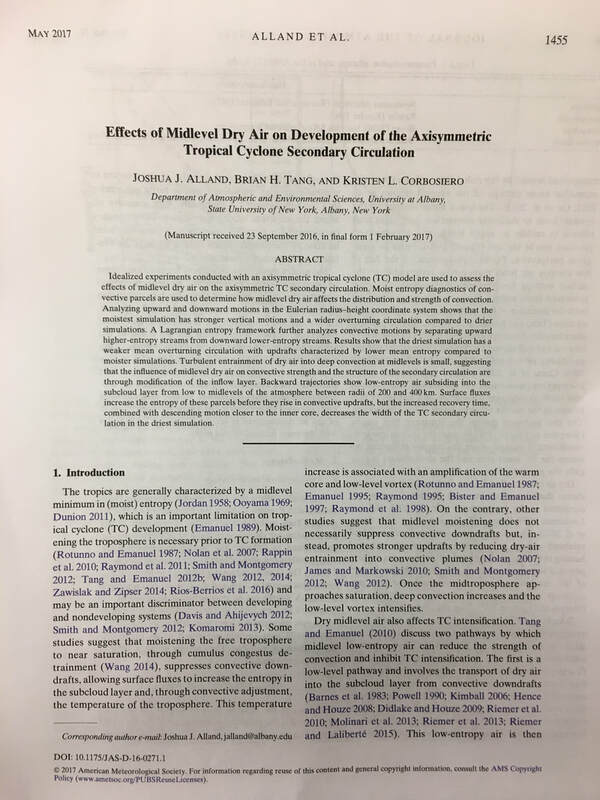 Presented a research project for ATM 741: Special Problems in Tropical Cyclone Research. 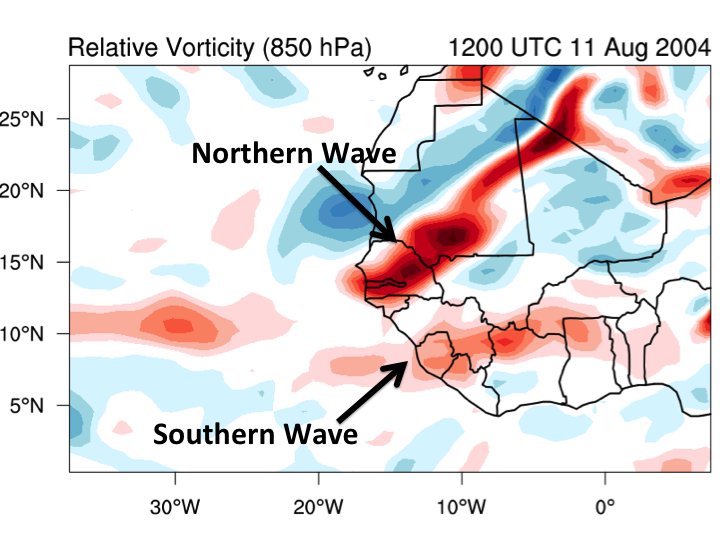 Summary: Waves north of the African easterly jet can merge with waves south of the African easterly jet and positively contribute to tropical cyclogenesis. 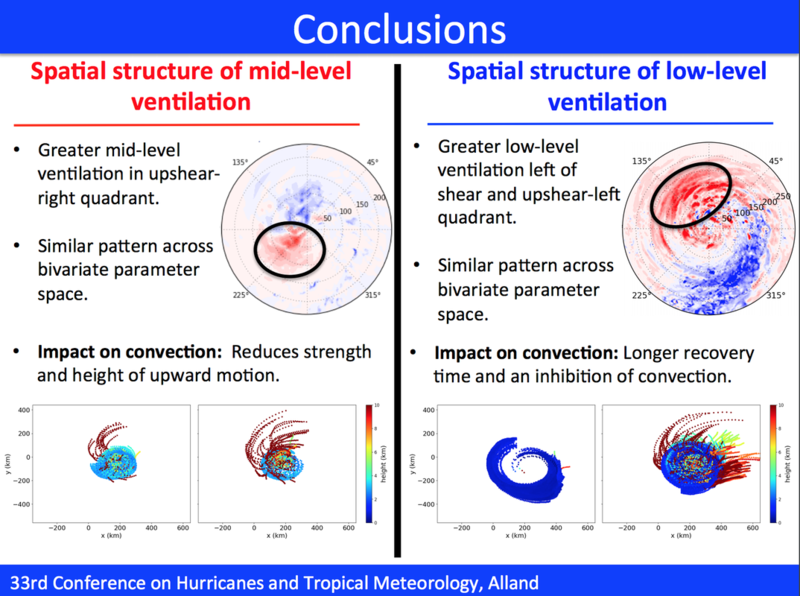 Presented at the 32nd Conference on Hurricanes and Tropical Meteorology. Summary: Dry mid-level air is transported into the subcloud layer, acting to decrease both the radial width of convection and the net upward vertical mass flux in simulated tropical cyclones. Co-Chair and Session Chair of the 2015-2016 AMS Student Conference Planning Committee. Served as one of the main organizers of the AMS Student Conference. The agenda for this conference can be found HERE. Presented a talk at the 17th Cyclone Workshop. 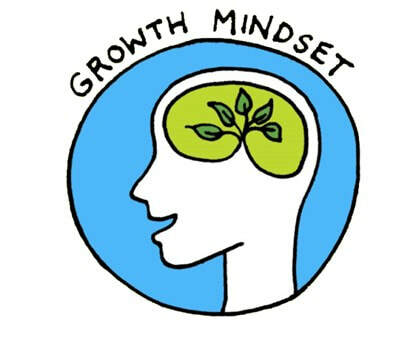 The talk link can be found HERE. Summary: Dry air entrainment into the PBL reduces the mean upward vertical mass flux and increases the spinup timescale of a simulated tropical cyclone. Presented a poster at the 14th Annual AMS Student Conference. Summary: Quantified the necessary mid-level moistening before TC development. Published an article to "Physics Today" based on research from Dr. Kristen Corbosiero's TC class.